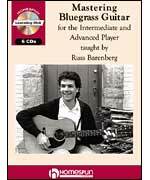 If you have always wanted to play the hot licks and impressive solos of the great bluegrass guitar players, then this exciting series of lessons is for you. Russ Barenberg gives flatpickers new challenges and classic tunes to play. Best of all, when it’s time to step up and play a solo in a jam session or performance situation, he gives you the tools you need get it right. Russ reveals many of the secrets to his success as a top player. You'll develop solid skills as he leads you through Clarence White-inspired licks, Texas swing back-up progressions, bluegrass breakdowns and fiddle tunes. Before long, you'll be playing intricate solos, fills and licks that use cross-picking, “floating" licks, syncopation, quick position changes and other advanced guitar techniques. These tapes will move you into exciting new musical territory and are guaranteed to have you picking like you never dreamed you could! Tunes: "Roll On Buddy," "New Camptown Races," "Beaumont Rag," "Wildwood Flower," "Columbus Stockade," "Willet’s Horn-pipe," "Timor The Tartar," "Morning Glory," "Nine Pound Hammer," "Pike Country," "Sandy Burn Reel," "Cedar Hill," "Over The Waterfall," "Pretty Polly," "Will You Miss Me," "Farewell Blues," "Orange Mountain Special," "Rocky Mountain Goat," "Billy in the Low Ground," "Bill Cheatham," "Barrel Of Fun," "Silver Bell" and "Shenandoah Valley Breakdown."